Each week I bring you useful and thoughtful ways to cultivate a life of restfulness, wellness, and balance so we can live full and meaningful lives. Each week I will have a conversation with experts in various fields that share their wisdom to help us begin to cultivate this practice in our own lives. We'll uncover wisdom in areas of rest, renewal, sleep, spiritual disciplines, finances, wellness, and more. The show comes from a Christian worldview and will be most enjoyed by other followers of Christ. 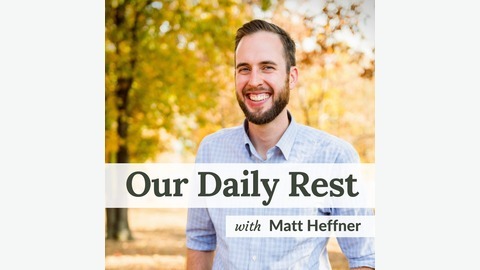 Hosted by Matt Heffner founder of Our Daily Rest. More than a decade ago he was diagnosed with a chronic disease that began his journey to jump out of the fast lane, slow down, and live more fully each day. And now he'd like to take you along on that journey. Get more resources at www.ourdailyrest.net. How she's finding rest right now Heather Dixon writes over at The Rescued Letters equipping women to trust in God, face their greatest fears, and choose life, especially when life presents its most difficult circumstances. [su_button url="https://itunes.apple.com/us/podcast/our-daily-rest/id1209722194" target="blank" style="flat" background="#717c6b" size="6" radius="0"]Subscribe on iTunes[/su_button] [su_button url="/renewing-library-signup/" target="blank" style="flat" background="#717c6b" size="6" radius="0"]Subscribe by Email[/su_button] The first part of the conversation the audio is a little fuzzy. But stick with us because we got it sorted out further in. Links & Quotes Mentioned in the Show Heather has a full series on battling anxiety with biblical truth HERE. Learn more about Heather and her full story. Here's information on Vascular Ehlers-Danlos Syndrome. Learn one of the breathing techniques she me mentions at the bottom of this page. Scripture she mentioned: "The Spirit of God has made me; the breath of the Almighty gives me life." Job 33:4 "Finally, brothers and sisters, whatever is true, whatever is noble, whatever is right, whatever is pure, whatever is lovely, whatever is admirable—if anything is excellent or praiseworthy—think about such things." Phillipians 4:8 "Trust in the Lord with all your heart and lean not on your own understanding." 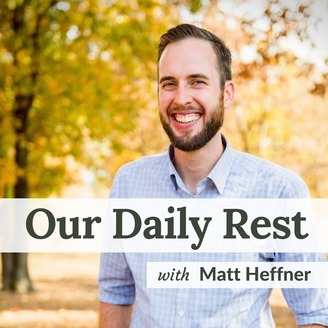 Proverbs 3:5 This Episode is Brought to You By Audible For listeners of the Our Daily Rest podcast, Audible is offering a FREE audiobook download along with a free 30-day trial of their service. They have a selection of more than 180,000 titles to choose from. To learn more and download your free audio book visit audibletrial.com/ODR. Red Oak Collective This episode is also brought to you by the Red Oak Collective shop. A collection of goods designed to be an encouragement for your soul. You can learn more here. Be sure to use code ODR5OFF for $5 off your first order of $25 or more. How to Listen to the Podcast Here's a short guide on how to easily listen to the podcast each week or how to leave a review on iTunes (very much appreciated! ).